It’s Only a Week, After All. Check. Last May, George took our two oldest children (Eva, 7 and Vincent, 6) on a Larrabee family camping trip. I wrote all about that weekend in a post called “I Want My Family Back, Stat!” For me at home, it was the longest weekend ever. I didn’t go on the trip because I’m (literally) not a happy camper, and I also had baby Valerie to think of. I assumed my 18-month old would also not be a good camper. I agreed to let Eva and Vincent leave that weekend, assuming I would be able talk to them, see pictures of them, and exchange voice mails while they were away. Boy, was I wrong! I didn’t realize there would be no cell coverage where they were camping the entire weekend. By the end of the third day they were gone, I decided to reach out to someone who had been on the trip. How were my children? Have you seen them? What did you all do? Are you back? Why isn’t my family home yet? Although some might disagree, I don’t think I’m excessively hyper-protective or over-paranoid about my children. Well, okay. Maybe I am. But if you had been a seasonally-single mother for seven years, you might be also! Except for this camping trip last spring, I have never been apart from my children. I’ve chosen to be a stay-at-home mom on purpose, so that when their dad is away fishing for months on end, there is one parent here at home for them every moment of the day, every day. I take them to the doctor, show up for field trips, and allow them to come sleep with me when they are lonely or scared. Plus, I just love these kids. Of course, they fight and I can’t stand that. My oldest can have a bit of a smart-mouth, and I can’t stand that either. Ugh. I do love my breaks to scoot out for a pedicure or a massage or even just a trip to the grocery store alone when I can! But I live and breathe my kids and without them, I don’t know what to do. My two oldest children and my husband departed just this morning for a week-long trip to visit G’s sister and mother in Arkansas. I did not go on the trip because of the same reason we canceled our Florida trip to see G’s dad…Baby On A Plane. I have dreaded Arkansas departure day for the last month; having to say goodbye to my children and endure without them for a week. I kissed and hugged, and kissed and hugged, my two oldest before they set off with Dad this morning. My friend at Jazzercise told me to let go and allow my oldest children have this adventure, and for everyone to try and experience it with joy and gratitude. G has missed so many months of our childrens’ lives while he has been at sea, and this is a great opportunity for him to enjoy an extended time alone with his two oldest. After all, I’ve had months and months, added up to years, alone with all of our children. Can I let go enough to allow them one week with their father? I don’t know. But I’ll try. 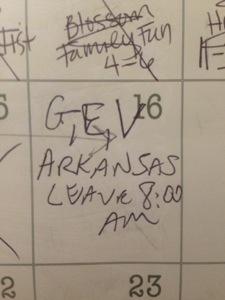 G marked the date on the calendar.